DOMINATOR PLATINUM high-performance DDR4 memory is designed for world-class DDR4 system builds. It's built with hand-screened ICs, undergoes rigorous performance testing, and incorporates patented DHX cooling for reliable performance in demanding environments. 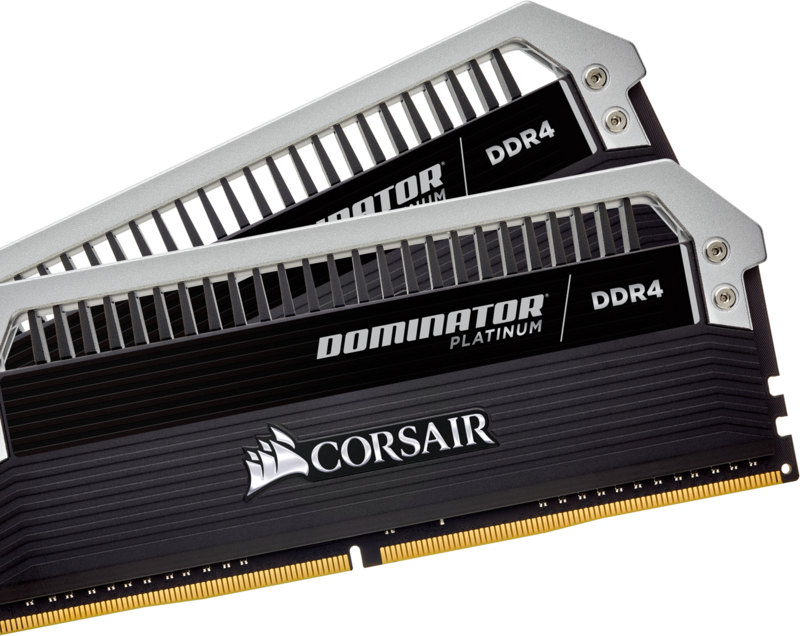 DOMINATOR PLATINUM high-performance DDR4 memory is designed for world-class DDR4 system builds. It's built with hand-screened ICs and incorporates patented DHX cooling for reliable performance in demanding environments. Achieving maximum performance is easy -- built-in XMP 2.0 support gives you trouble-free, automatic overclocking. DOMINATOR PLATINUM modules work with the CORSAIR LINK system for temperature monitoring, and you can even enhance the subtle white LED lighting by adding a light bar kit to match or contrast your system. DOMINATOR PLATINUM DDR4 modules are designed to take advantage of the improved clock speeds, bandwidth, and capacity of the DDR4 platform. Our modules are tested across multiple DDR4 motherboards for reliably fast performance. DOMINATOR PLATINUM is fully compatible with the XMP 2.0 standard. A single setting is all it takes to automatically adjust to the fastest safe speed for your DOMINATOR PLATINUM kit. You’ll get amazing, reliable performance while maintaining full data integrity. DOMINATOR PLATINUM DDR4 modules already have generous overclocking headroom, but to push them to extreme performance levels, you need active cooling. The DOMINATOR AIRFLOW PLATINUM is designed for quiet operation and optimal cooling efficiency, and it works with CORSAIR LINK software for customization and control. It’s included with some DOMINATOR PLATINUM kits and optional with others. With CORSAIR LINK software, you can control PWM fan speeds directly from your Windows desktop, actively monitor the temperature of every DOMINATOR PLATINUM module in your system, and control a host of CORSAIR RGB lighting products.